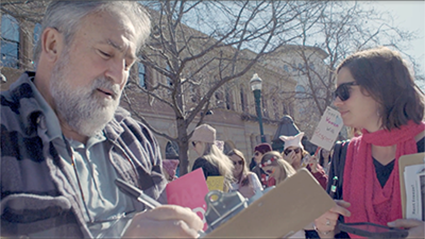 At Capacity—a collectively-made documentary feature film by 19 students in a UC Santa Cruz film class—will screen twice at the 2018 Santa Cruz Film Festival, which takes place downtown October 3-7. It was created in UCSC film and digital media professor Irene Lusztig’s winter quarter Documentary Production course, where the students spent three months working together on a 73-minute film about the housing crisis in Santa Cruz. The result is a timely look at the many complex issues affecting local housing. The film documents activities ranging from the local rent freeze campaign (from signature gathering to the city council vote), to high-end real estate tours, to housing lawyers on the job. It also covers topics such as Santa Cruz’s growing homeless tent encampment, new construction, and tiny home dwellers. "My students are really excited about getting to show at the festival,” said Lusztig. “It’s their first time at a film festival for most of them, and it’s such an important issue right now." "I have done this kind of group project a number of times before, but I think this time, in particular, all of the students felt like stakeholders and were really invested in the topic, because housing in this area affects every single one of them," she added. "Most of them personally knew friends who live in cars, tents, garages, pool sheds, or on couches." The film notes that Santa Cruz County is currently the fourth least affordable housing market in the world, with home values rising 8.6% in the past year and on track to reach an average price of $892,000 by January of 2019. "It was difficult to find subjects who were willing and able to talk about their housing situations, since a lot of people are living in spaces that they're not necessarily supposed to be in," observed senior film and digital major Tessa Jagger-Wells. "We had to work very hard to make sure people felt like we were on their side, and that we would protect their identity." "It's also just a very sensitive topic in general, and most people feel strongly about different issues. It was a challenge to represent different perspectives and create a relatively unbiased film, but we certainly tried to talk to different kinds of people and tell the most complete story possible." "I learned a lot about Santa Cruz itself," she added. "It's an incredible city with a complex history that has led us to where we are today. A lot of the complications that have resulted in the housing crisis come from the fact that Santa Cruz has so much to offer. Some people try to take advantage of that, but I think a lot of people really appreciate it and are trying to protect it." Lusztig noted that the class offered students a rare opportunity to work together on a large project. Every aspect of the film was produced collectively, from research to shooting to editing. In the process, the students not only learned a great deal about filmmaking, but also about how to collaborate and negotiate with others, as well as how to be accountable for their own work in a group. "The most important thing I've learned from this experience would have to be building a strong relationship with the group I'm filming with," said senior film and digital media student Kelly Leonardson. "Some of us handled the cameras better, others knew how to talk and plan out shoots better. We were able to help each other learn more about filmmaking along the way. I'm pretty sure I've made lifelong friends from taking this class." "Overall, I still can't believe we were able to make a feature film in 10 weeks," she added. "This class has definitely given me hope for the future." Jagger-Wells added that she was surprised by how easy it was to collaborate with her classmates. "A lot of it was due to the flawless guidance of our professor. Irene was able to provide us with the tools we needed to create the film, while keeping enough distance to let us make our own creation. We also had a really great group of people, with a great work ethic and a variety of skills. I learned a lot about working in a group, especially a large group. It can be difficult when everyone has a different vision for the final product, but we were able to create a cohesive film that represented the work we all put in." The film was directed by UC Santa Cruz students Jazmine Corona; Joshua Cosbey; Andrea Diaz; Bianca Galeana; Jiaxun Gao; Carlos Gonzalez; Alexis Guzman; Michelle Hua; Tess Jagger-Wells; Noel Kabe; Enrique Labrada; Kelly Leonardson; Kathy Liang; Juliette Perrault; Bojun Qiu; Collette Quach; Tatianna Stapleton; James Tanjuatco; and Hui Zhang.